2015 Road Trip Photos #34: Stately Davis Manor « Midlife Crisis Crossover! Day Five took us beyond New Orleans and into the southeastern tip of Mississippi, where we found a few different must-sees on our road-trip checklist. 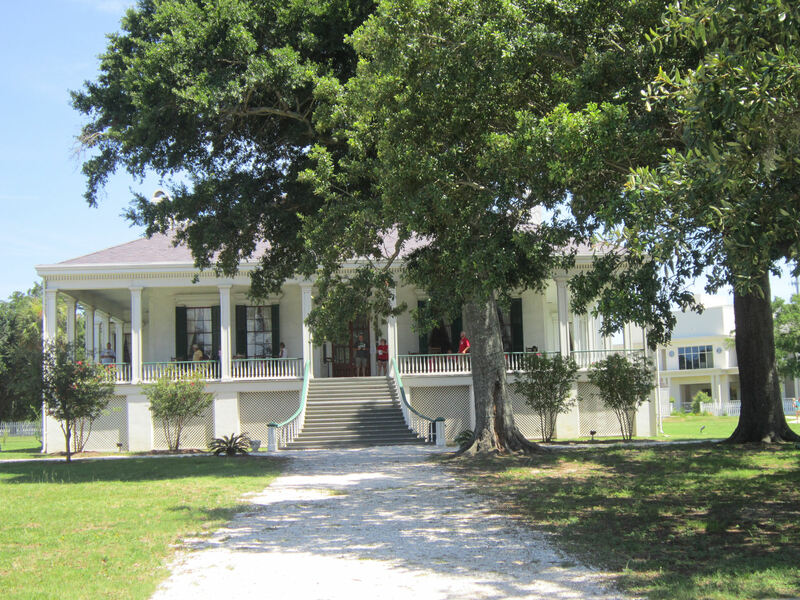 We’d hoped to see something distinctly in Mississippi after our disappointing nonstop Day Two drive; genuine Gulf of Mexico water; a true Southern beach; and an authentic Southern mansion or plantation, whichever was available. 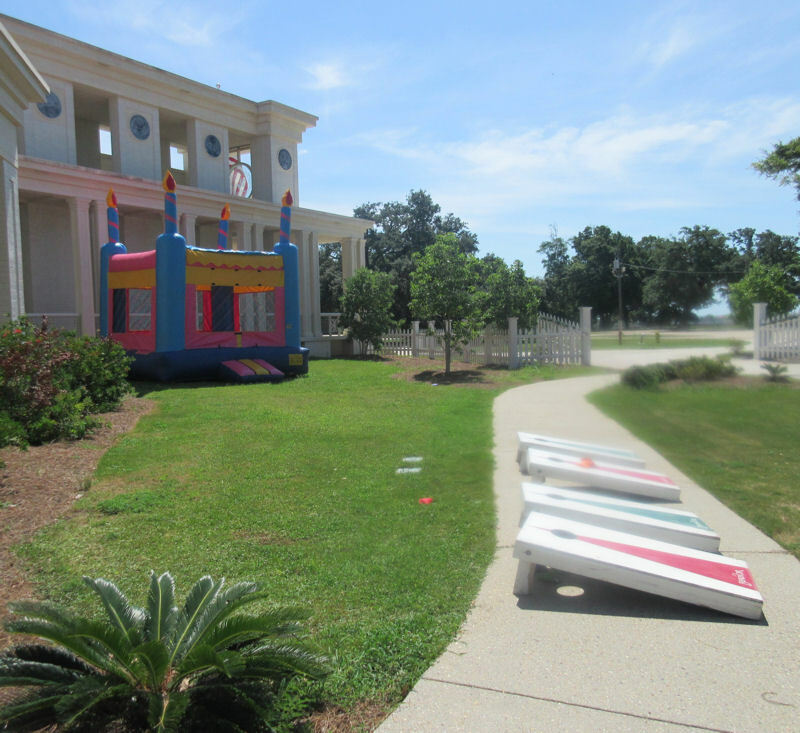 We found all of that and more in the coastal city of Biloxi. 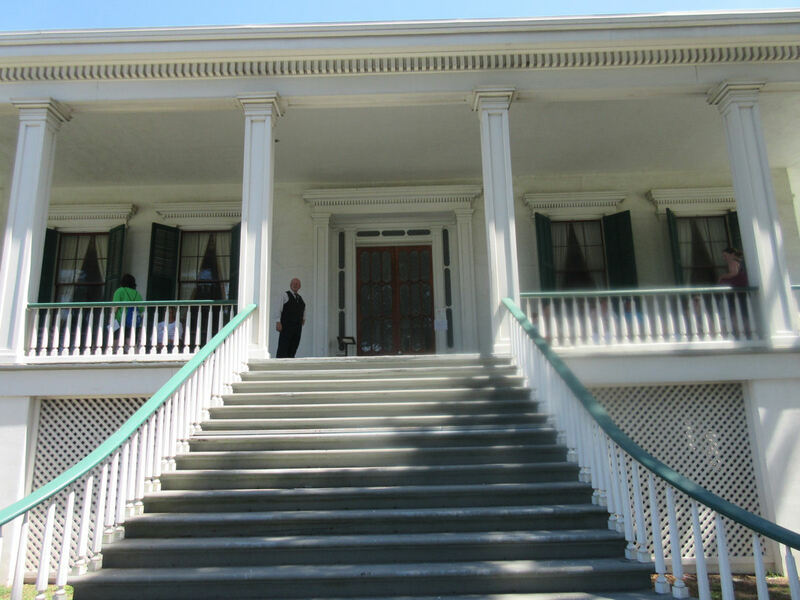 Our first stop along the way was at the mansion called Beauvoir, whose property from 1877 to 1889 was the home of Jefferson Davis, President of the erstwhile Confederate States of America. Yes, there’s a gift shop. The veterans’ home functions ceased circa 1957. This 1940 sign has yet to be updated. 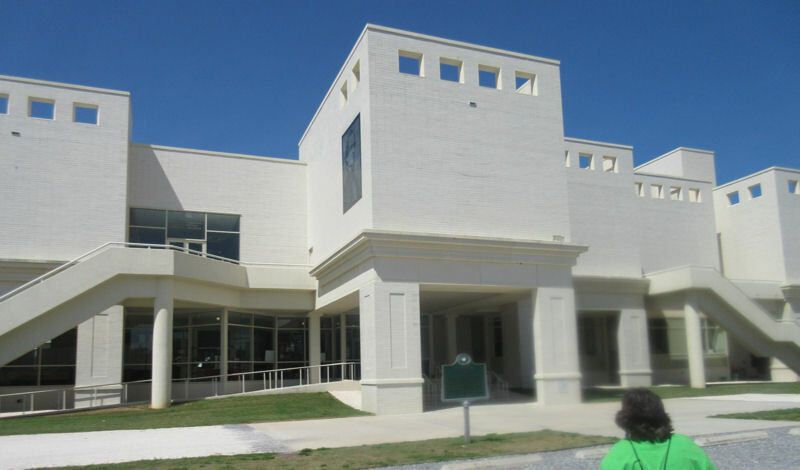 Visitors pull off Highway 90 next to a suspiciously modern building that resembles nothing you were hoping to see. It’s vaguely museum-ish inside, but it’s the mandatory gateway before you reach the sections listed on the National Register of Historic Places. My camera lens was still drying off after the morning’s wretched humidity in New Orleans. Most of this entry’s pics were consequently Anne’s. The original home dates back to 1852, when construction was complete at the behest of its original owner, a businessman named James Brown (no, not that one) who named it Orange Grove. The “Beauvoir” name came later from one of the subsequent owners and means “beautiful view” according to their brochure. Anne and I pronounce it “Beau-VWAH”. Our tour guide pronounced it “boo-vore”. I suppose he would know. After the Civil War ended in 1865, Jefferson Davis found himself out of a job and in prison for the next two years till he was bailed out by a few cosigning professionals, including New York Tribune editor Horace Greeley. He moved around a bit for the next several years — at first fleeing to Canada, then taking advantage of occupational opportunities in Tennessee and England. This official statue once stood in the Library, but has suffered damage over the decades. 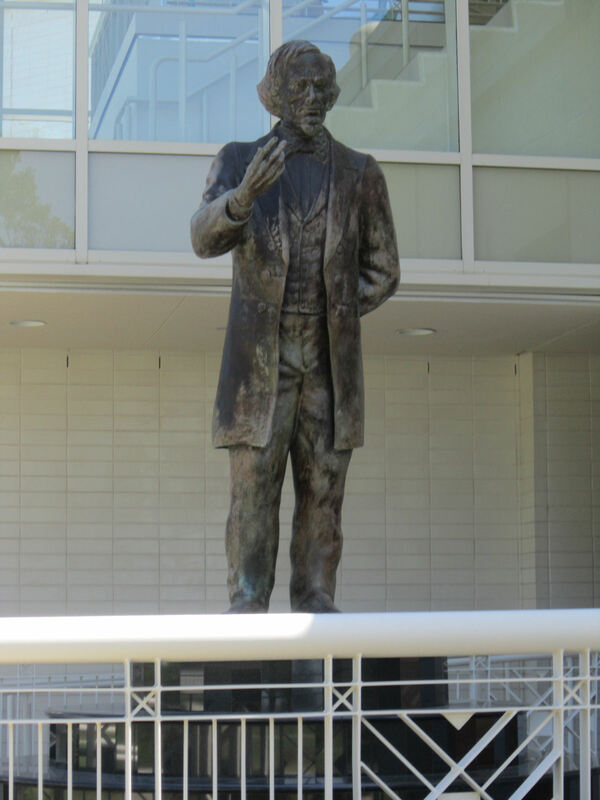 It wouldn’t be the only Jefferson Davis statue we saw on this trip. Despite the charges of treason against him, Davis was pardoned in 1868 by President Andrew Johnson, not one for worrying about his reputation. In 1877 Davis decided it was time to begin writing his memoirs and moved into a cottage on the Beauvoir estate with the blessing of its then-owner, widowed novelist Sarah Dorsey. Stairway to a most unusual history. The grounds once held several buildings besides the home itself, including a Presidential Library, a Confederate Museum, and the cottage where Davis wrote. 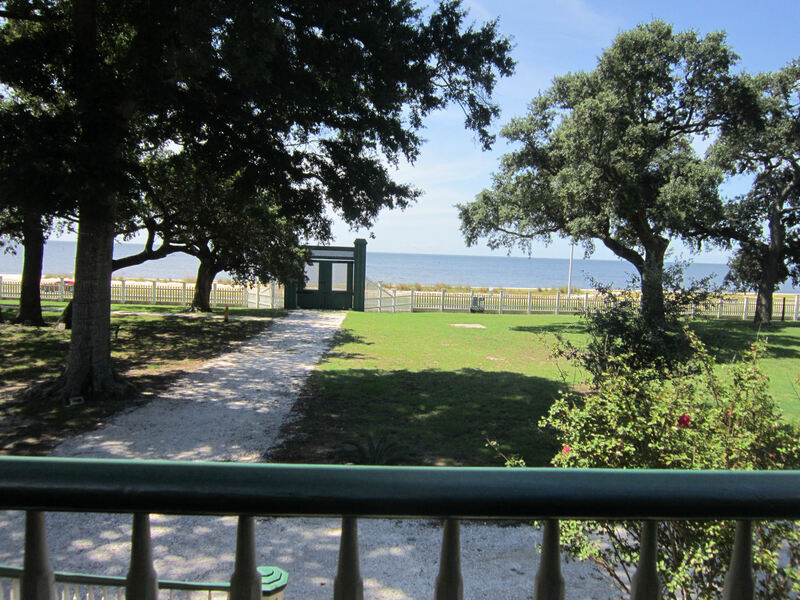 The front porch provides a scenic overlook upon the spacious front lawn, a few of the remaining constructs, and the Mississippi Sound, which leads right into the Gulf of Mexico. Keen observers of modern American history will recall the Gulf of Mexico wasn’t the best place to be around ten years ago. 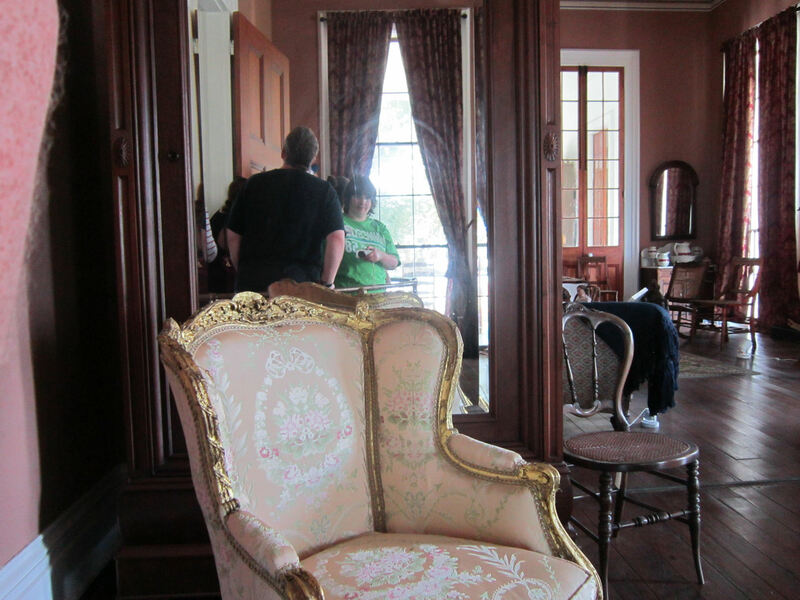 The tour was concerned largely with the home’s original furniture and contents, or replicas of same, much like The 1850 House we’d seen back in New Orleans. Beauvoir is much wider and has overall shinier things. Mirror-universe versions of m’lady and myself on the tour. Worth noting: the original pine floors have remained relatively undamaged despite once bearing a foot of standing seawater for eight hours. 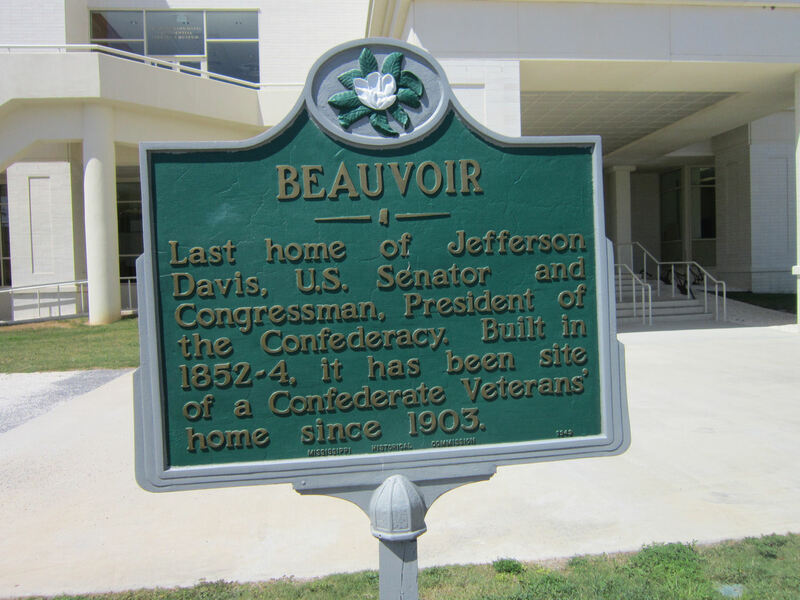 By 1879 Davis had purchased Beauvoir in full and moved into the main house with his second wife Varina and his longest-lived child, daughter Winnie. He passed away in 1889 during a trip to New Orleans, where he literally caught his death of cold. He was buried in Metairie, but later relocated to Richmond, VA. Varina and Winnie lived at Beauvoir two more years before moving on. 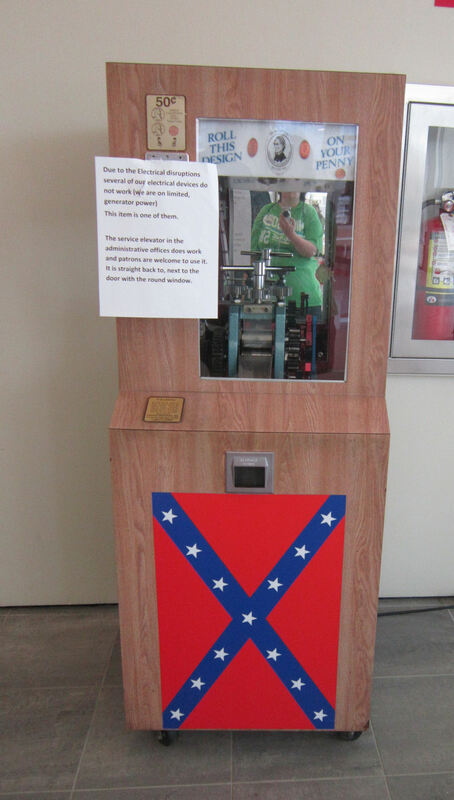 Another piece in the Jefferson Davis art collection. 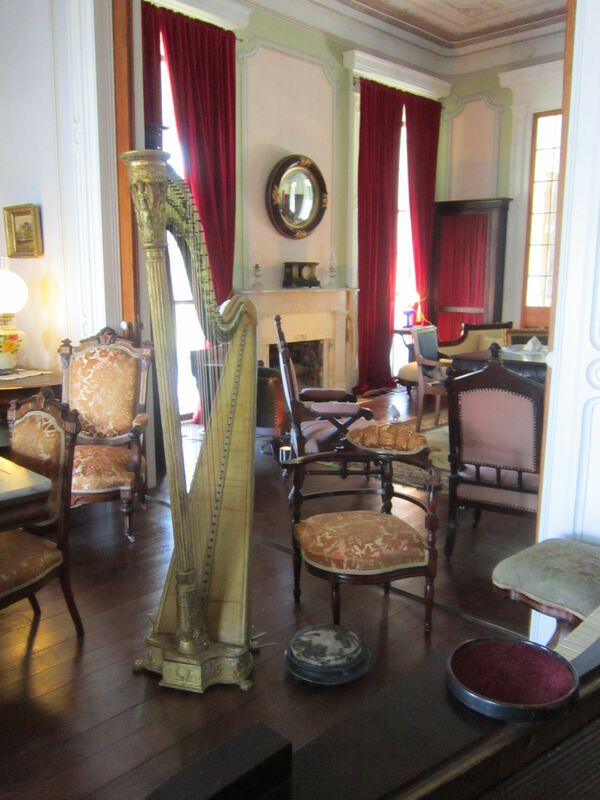 As we found with The 1850 House, upper-class citizens of the era did enjoy their harps. The backyard wasn’t covered on the initial tour, but includes a few surviving artifacts of note and some reconstructions as time and funding have permitted. It’s not that we didn’t want to see those items. We had hundreds more miles of driving ahead of us and had to be choosy. Parts of this ex-plantation are apparently available for parties and weddings. The tour guide commentary was strictly limited to descriptions of the home and its contents, everyday living, and some light historical context as it pertained to fashion, arts, and technology of the time. 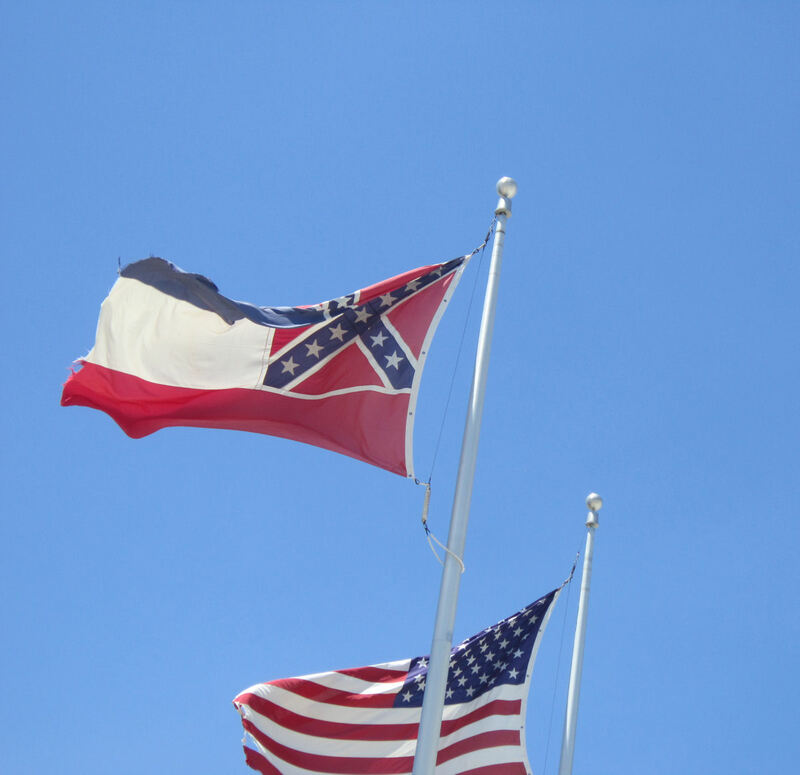 Other than one specifically worded mention of the original owner’s “enslaved chefs”, slavery and most other factors pertaining to the Civil War were largely circumlocuted, even in this, the 150th year since the South’s surrender. Make no mistake: you are not at home. 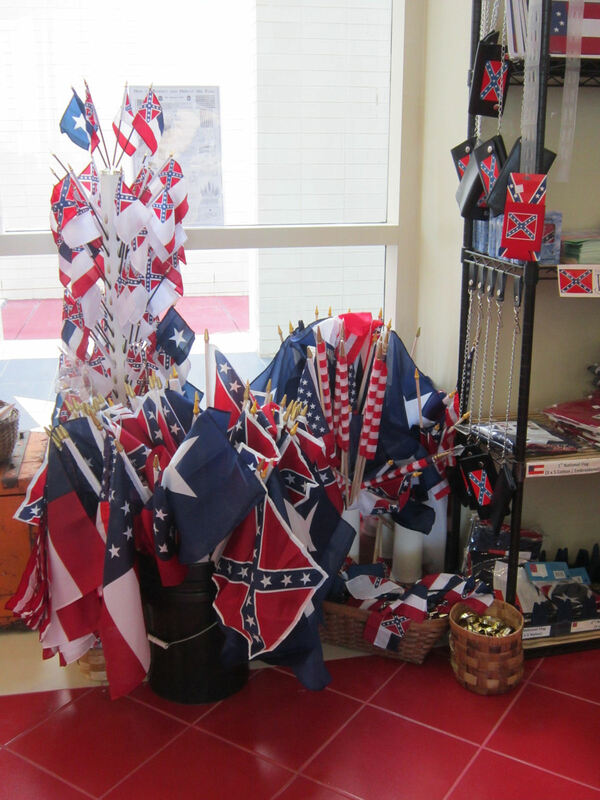 After the tour, guests are given free rein to go wherever, including the extensive gift shop that looks pretty much as you’d expect, save a remarkably diverse staff, especially compared to the other places we visited later. Or visit took place twenty-eight days after the tragic, horrifying, disgusting events at Emanuel AME Church in Charleston, SC. This vacation was planned months before the murders and the ensuing nationwide debates about flags and symbols and the kinds of pride people latch onto with unshakable ferocity. 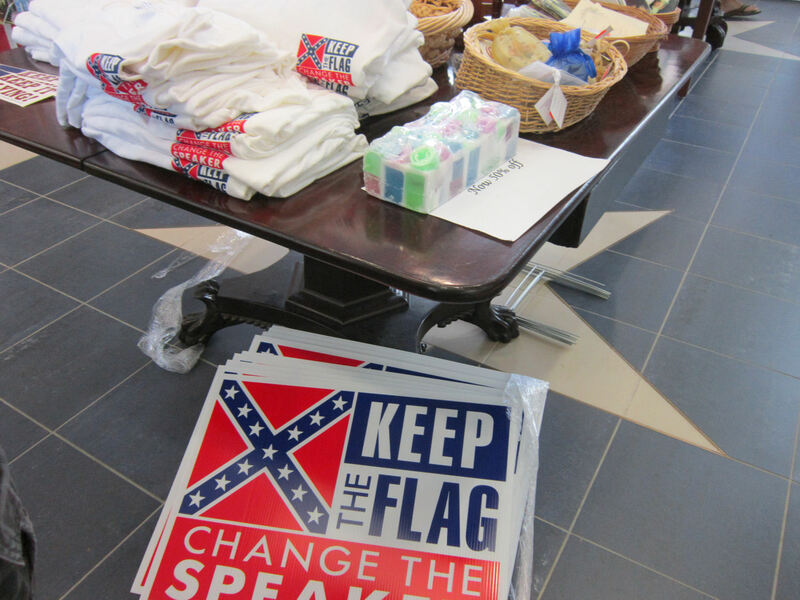 A month later, unyielding fans of the Confederate States of America could still find commemorative merchandise if they knew where to look. My wife’s first choice of souvenir would’ve been a good ol’ smashed penny. Alas, power outages the previous night left them running on auxiliary power and doing without secondary electrical devices. Thus she was denied. 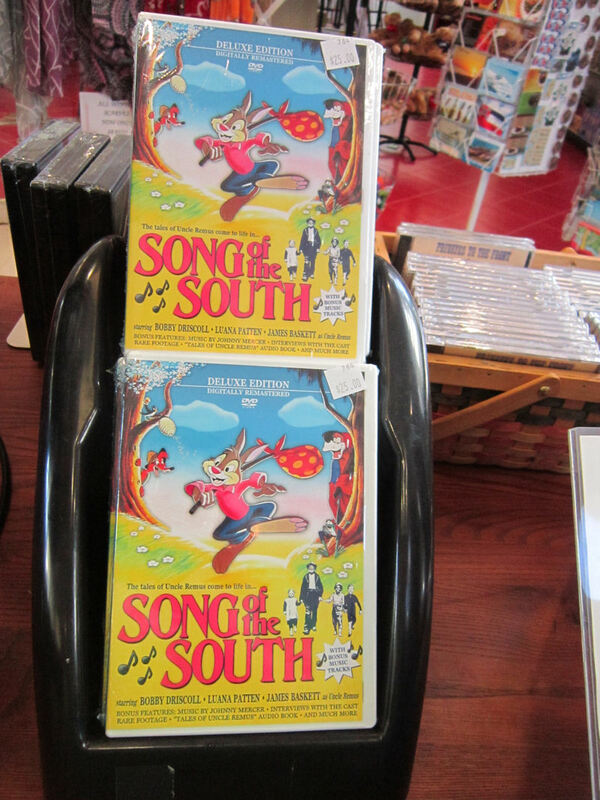 My souvenir of choice: a genuine bootleg copy of the Walt Disney live-action/animated classic Song of the South, which turns 70 years old in 2016. I’d be tempted to review it as a separate entry if I thought there were a demand for it. 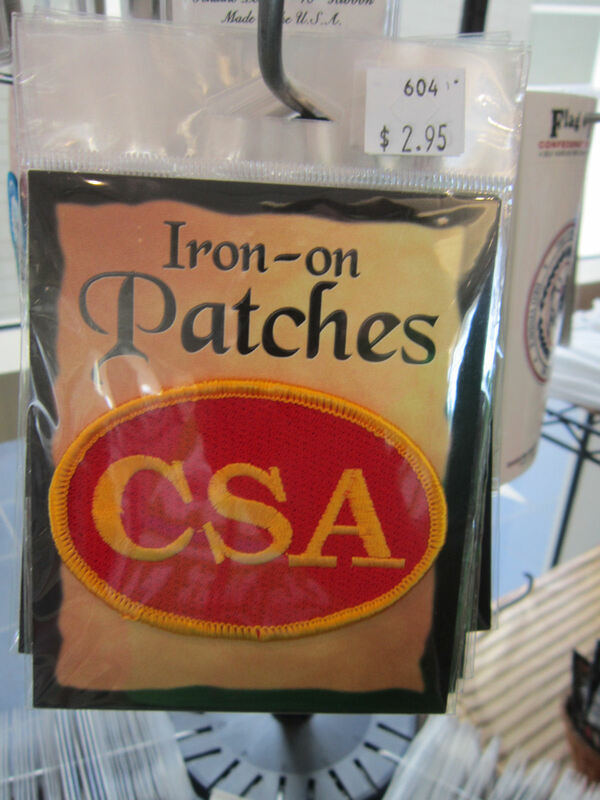 A few additional artifacts are on display in the gift shop, but there’s not nearly as many as there used to be. 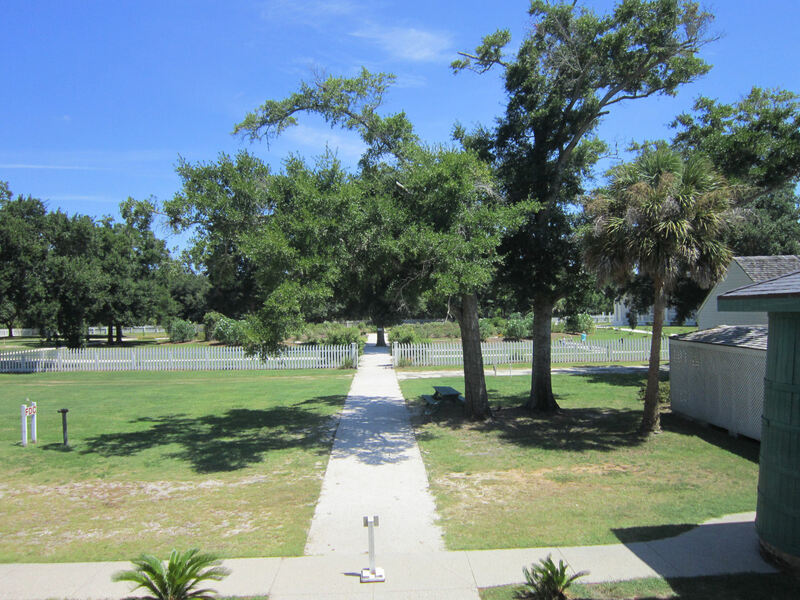 Hurricane Katrina devastated the Gulf Coast and every building along it, including the grounds of Beauvoir. Though the estate has endured no less than eighteen hurricanes to date, Katrina leveled quite a bit of it as well as the contents. The damage to the main house took years to repair, while a few items have since been replaced or reconstructed from scratch. 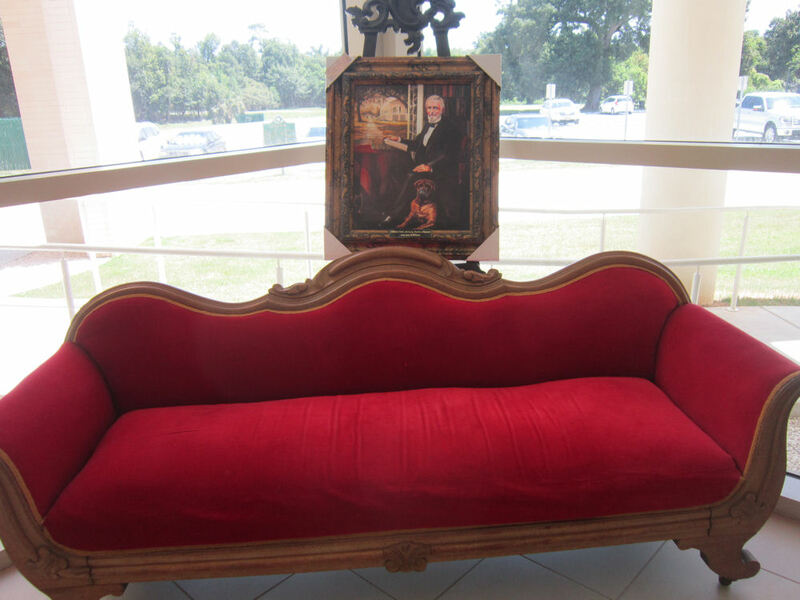 Plush couch for display only, not for fainting at these very sights. 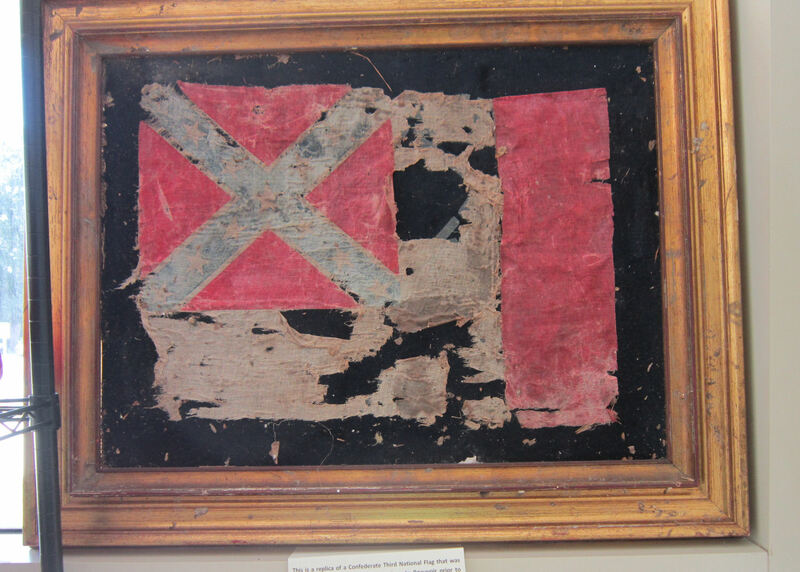 Once this was merely a replica of the Third Flag of the Confederacy, manufactured recently and in fine shape. 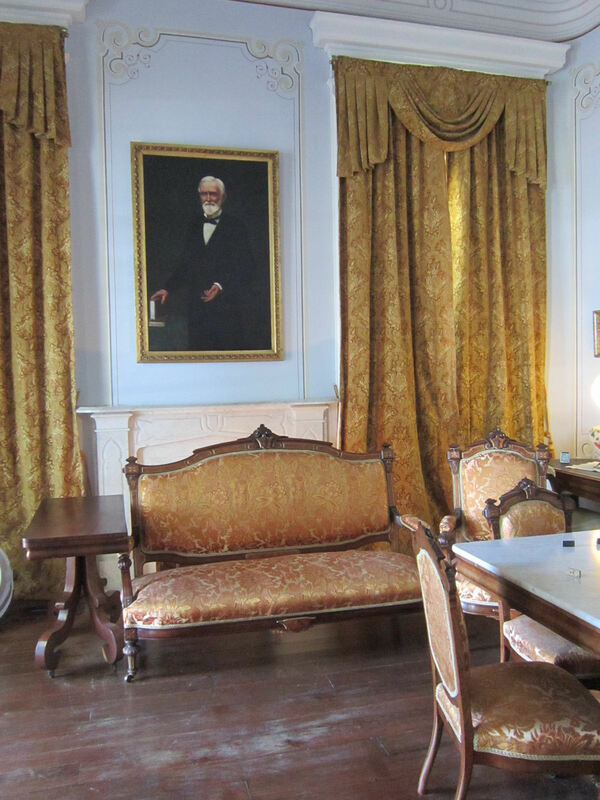 Then Katrina hit and, as our tour guide put it, rendered it “authentically distressed”. This Southern-pride variant refused to yield even to the ravages of Mother Nature. Thus the former Presidential home continues to stand tall today as a monument to a man who was, to put it mildly, a big deal in the resistance.